Finally – cookware that loves cooking just as much as you do! Meet Chef Inox cookware. This no-nonsense collection of stainless steel cookware means business. Chef Inox cookware is durable and reliable, designed to make everything about cooking easy. It’s the kind of cookware you can depend on to get the job done without a fuss – time after time. Chef Inox’s Enamelled Steel is the kind of reliable and enduring cookware that will take your cooking to the next level. Crafted from durable steel, with an enamel coating that won't absorb flavours or stains, Chef Inox's Enamelled Steel cookware features a thick base that allows for quick and even heat distribution and a rim designed for drip-free pouring. 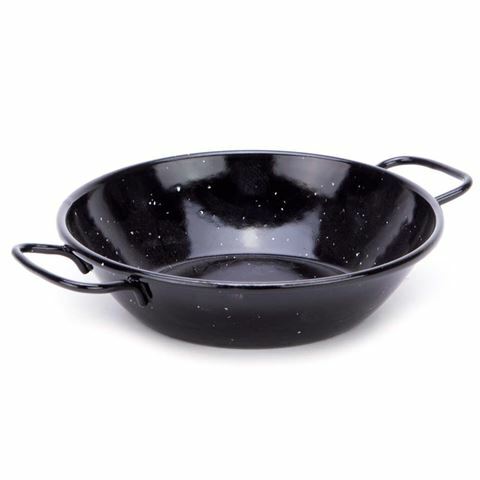 The sturdy handles also allow for easy lifting, so you can transfer your dish from oven to plate with no trouble at all. Versatile, hard-wearing, uncomplicated - the people at Chef Inox really have thought of everything. For anyone who’s truly passionate about cooking, Chef Inox cookware is the ultimate. It’s simple, smart cookware that’ll always be there for you. When it comes to cookware, what else could you ask for? Enamel coating won’t absorb stains or flavours. Thick, layered base ensures fast and even heat distribution. Rim designed for easy, drip-free pouring. Two sturdy steel handles for easy lifting. Energy friendly – use with low to medium heat only. Hand wash recommended with warm soapy water. Chef Inox Enamelled Steel cookware features steel handles, which may become very hot during use – especially when used in the oven. Please ensure you use an oven mitt when handling hot Chef Inox Enamelled Steel cookware.